The YogaShakti Mission is a Hindu organization founded in 1979 by Maha Mandaleshwar Ma Yoga Shakti Saraswati, an Indian female guru whose philosophy is “Life is given to explore the Ultimate Reality, whatever it may be; besides learning the skills of survival”. After migrating to the U.S. in 1977, she established ashrams in Ozone Park, New York, and Palm Bay and Deer-field Beach, Florida. She has also organized four ashrams in India; Mumbai, Kolkata, New Delhi and Gondia. The ashrams teach to maintain a balance between all forms of yoga; Hatha, Raja, Bhakti, and Karma. Devotional services, classes and retreats are held at all centres. Ma Yoga Shakti was born in Banaras, India, on April 6, 1927, in an aristocratic family. At a time when women often rejected the educational system, she received an M.A. in Political Science and was the founding principal of a women’s college in Bihar. Her early spiritual associations were through the Theosophical Society, and she was also the President of the Annie Besant Lodge in Chapra. She became a political reformer for women’s rights and ran for Parliament in 1957. Mataji played many roles in life; a devoted housewife, an enlightened educationalist and a political reformer. In her youth, she was fascinated by higher ideals and heard the voice of the Divine within her. Born with a keen urge to know the unknown, she devoted herself to the quest for solutions to the great mysteries of life. 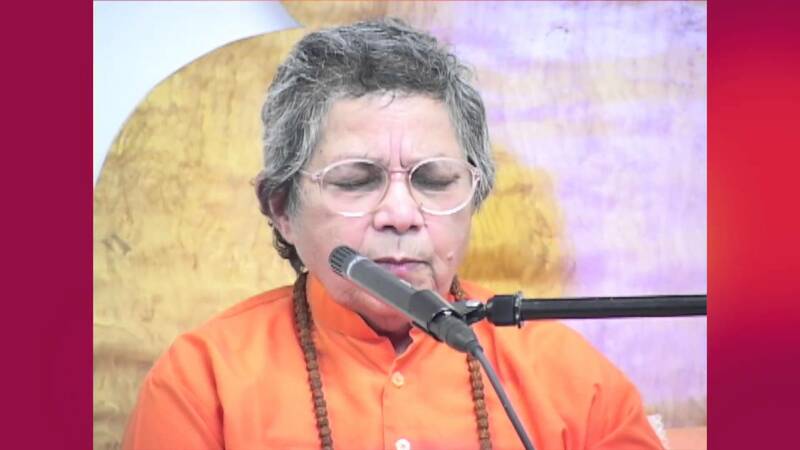 In 1965 she renounced the world to become a Paramadesa Sannyasin, one who puts on the orange robes of monasticism. She shortly won recognition, rare for a woman, from India’s traditional monastic orders, being designated as “Shakti Sant Shiromani” at the Ujjain Kumbha Mela in 1969, and later as “Maha Mandaleshwar” at the 1974 Kumbha Mela at Haridwar by the Niranjani Akhara, one of India’s largest and most venerable orders. She is one of the few and esteemed 22 Niranjani Maha Mandaleshwars. Yoga Shakti has published several books or commentaries including “Yoga Syzygy”, “Techniques of Meditation”, “Shri Satya Narayan Katha, Adhyaatma Sandesh—Spiritual Message”, and “Invisible Psychic Lotuses”. The Mission also publishes the Yogashakti Mission Newsletter every month. Each center has classes in yoga, meditation, scriptural studies, Satsang, and religious functions. Ma Yoga Shakti travels between the centres and her goal is for yogic knowledge to be spread and known by all, believing firmly that Yoga helps man to face and bear the stress and strain of modern life. There are many techniques in Yoga which, when practised under expert supervision give positive results for physical, mental and spiritual growth, thereby unfolding unused and latent powers. The secret techniques are quite revolutionary and provide innumerable benefits for the physical, mental and spiritual well-being of man. Florida: The Yoga Shakti Mission, Palm Bay Ashram is a paradise created by Mataji on twenty acres of pinewoods in the St. John’s River basin. Its purified vibrations also provide a venue for Mataji’s satsangs and lectures as well as regular hatha yoga classes and Sunshine Lectures on Sunday mornings. Hatha yoga classes are held morning and evening, vegetarian lunches are served monthly, and daily aarti (prayers) is conducted. New York: The New York Ashram is located in Queens NY, close to JFK airport. It has a large temple and yoga hall inaugurated in 1992. This center serves as the International Headquarters for all of Mataji’s ashrams. Aarti, Shiva Puja, Hanuman Puja, Laxmi Puja, Satsang, Sunshine Lectures and other and Holiday Programs are conducted on a weekly basis. London: Yoga Shakti Mission Trust London operates from The Hounslow Yoga Centre and holds regular yoga classes. It’s a mere five minute walk from Hounslow Mainline Station or Hounslow Central Tube. India: The ashrams in India (Mumbai, Kolkata, New Delhi and Gondia) are steeped in Yogic wisdom and one can always find Mataji’s presence in the halls and prayer chambers. They are beautiful mixtures of the international centres and have the privilege of operating from the Yogic heartland. In Mataji’s own words, “My legacy, my message to all is, be honest, work hard and love and oblige people as much as you can. Do good, be good, think and speak good all the times. What one can do is a part of human religion. What one cannot do, one should forget about. Setting a goal in life is important for everyone. The Mission of my life is: To test the Truth of Divine Wisdom spoken and handed down by tradition by the ancient seers of India”. For more information on Ma YogaShakti Mission ashram’s and centres, please visit the official website.